Few people at EllisDon these days will recognize the name Vernon Bayley, but without him there would be no EllisDon. For thirty years, Vern gave everything he had to his family and to ED (maybe not in that order), as an estimator and then very quickly as Senior Vice President and Chief Estimator. When he began, EllisDon was a small time outfit in London Ontario. By the time he left in the late eighties, EllisDon was a billion dollar industry leader, active across Canada, with the Rogers’ Centre under construction and leading the charge at Canary Wharf in England. Vernon wasn’t EllisDon’s founder of course, but for decades in this crazy business, he was our foundation. And of course, there’s always a good story, or several. Born in 1921, Vernon served in the British army in WWII. He married Kathleen, started his family and then moved the whole clan to Canada in 1957. Vern had friends in London, and shortly after his arrival someone told him that an upstart construction company was looking for an estimator. Vern scheduled an interview, and was pleased to see that EllisDon was on Oxford St., which ran nearby his new place, so he figured he’d just walk over. Unfortunately, Oxford St. runs the whole length of the city, and Vern was starting at the absolute wrong end. When he finally arrived about three hours late, with very sore feet, the first question was ‘What the hell?’ I guess his determination got him the job. Two years later, Don Smith decided his current Chief Estimator was shopping sub prices and fired him; Vern became the new Chief, and there were never any ethics issues again. Don Smith was high energy, driven, a bit mercurial. Over the next thirty years, very many people came to EllisDon and very many left. Vernon, and only Vernon, survived. He was extremely capable, very calm in a storm, ethical without compromise and everyone loved him. Together for decades, these two built the foundation of a great company, and then they built a great company. Vernon traveled all the time. He successfully bid EllisDon’s first non-Ontario project, the Halifax Airport; we have been in the Maritimes ever since. He bid work right across Canada, getting us started in almost every Province. He and Don chased work in Saudi Arabia, Bahrain and Abu Dhabi. (When we got the job in Saudi, his son Kieron embraced the challenge, beginning another successful Bayley career at ED.) I should also mention his mentoring. From Michael Schaefer, who rose to become Chief Estimator and then COO, to Bob Swan who handled the National Gallery, the Convention Centre and SkyDome (and was the best conceptual estimator in Canada, period), Vernon was a builder of people as much as buildings. After he retired, Vernon and Kathleen went to India to help build churches and schools. Eventually, though, he caught some nasty bug, and this man who had never weighed more than 130 pounds in his life, lost about thirty of them. He had to come home, but he survived another three decades, so there was real toughness there. Vern could always laugh and enjoy a beer, either (before all these PC rules kicked in) at lunch or as the day wound down. 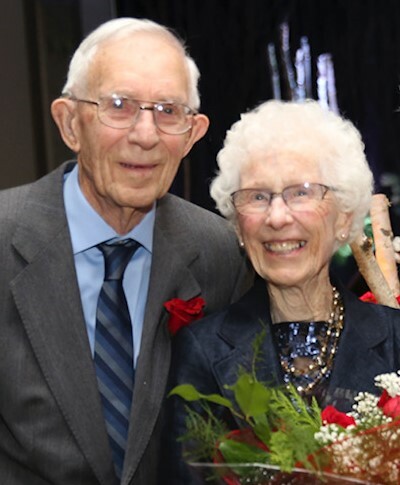 And Kathleen, his wife of 67 years, was just as much a part of the EllisDon family. I am certain they hold the record for consecutive ED Christmas parties, at exactly sixty. In 2016, when the DJ did that ‘pass the napkin’ game after dinner to get people up dancing, Kathleen ended up stuck with the linen, and at 92 years old dashed up to the dance floor to strut her stuff. They were planning to come again this past December, when suddenly Vernon started feeling ill. This past Tuesday a great life and a great era came to a close. Vernon was the last person standing from EllisDon’s beginning years and as fine a person, and an example for everything we all aspire to, as anyone I’ve ever met. May he rest in peace.